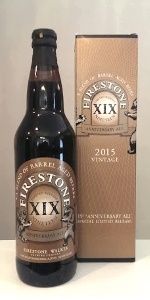 Firestone 19 - Anniversary Ale | Firestone Walker Brewing Co.
Jet; brandy butter on Christmas pudding; licorice + treacle, brown wild honey, anise, lots of unsweetened chocolate, some bourbon barrel, loads of dark caramel, whiskey coffee finish; boozy end, heavy. So… black. Residuals fermented right out. Mellow, big, sweet, with an edge. Fireplace beer. Moderate pour yields a 1/2 inch light tan head over a brown body with some lacing. Nose of caramel, raisins, with a definite barley wine aroma. Taste of raisins and barley wine. Good feel and overall, I was hoping for better. Cheers! Pours a deep brown, some light shows through around the edges. Smells like bourbon, chocolate, caramel, toffee, basically, it smells like a bourbon BA quad. Taste is super complex, I'm not good enough at this to describe it, but I'll attempt it. There is a lot of bourbon flavor, some chocolate, caramel, dates, toffee, maybe some coffee at the end. Mouthfeel is perfectly carbonated, and kinda sticky, like it coats your mouth. This is an amazing blend of beers, try it if you can. From notes -2016 trip to Central Coast. Had on tap at Barrelworks; couple of 3oz pours. Another excellent blended brew. Sticker Monkey really came through and stood out above the Parabola. Other beers really added well to complexity. Just a huge woody quad with a super full Imp stout. Then swatches of taste and smoothness from the brown and the oats. Big thumbs up. Got this one from vanlingleipa a while back. Cheers! APPEARANCE: A clear light brown pour yields a big, four finger, fizzier, foamy light brown head with good retention. Bistre brown body, clear, with no real carbonation. Head fades down to a foamy cap. A splotchy wisp and ring remain until the end leaving dots of lacing gown the glass as it empties. SMELL: Lots of caramel, toffee, oak, vanilla and cream, coconut, and a decent dose of bourbon as well. TASTE: Lots of bourbon and caramel sweetness up front, with toffee, vanilla and oak at the swallow. Big finish of bourbon, oak, milk chocolate, coconut, vanilla, toffee and butterscotch sweetness lingers on the palate. Plenty of booze as well. PALATE: Medium body and slightly higher levels of carbonation. Creamy on the palate, goes down okay with a big burn after the swallow, finishing somewhat sticky. Some decent heat lingers. OVERALL: This is excellent. Boozy for sure and the fizzy head isn’t all that great, but the flavor and aroma are top notch. A good feel on this one to boot. FW usually does a great job with these anniversary blends and this is no exception to that. One that’s well worth the effort and price tag if you see it. Thanks again, vanilingleipa. Always a pleasure. A masterpiece of complex bourbon, and blending. No carbonation yet a special barleywine. Smooth with above average mouthfeel. light brown, caramelized sweetness. Dangerously drinkable. Shared a bottle on Thanksgiving with arizcards. Firestone 19 - Anniversary Ale from Firestone Walker Brewing Co.